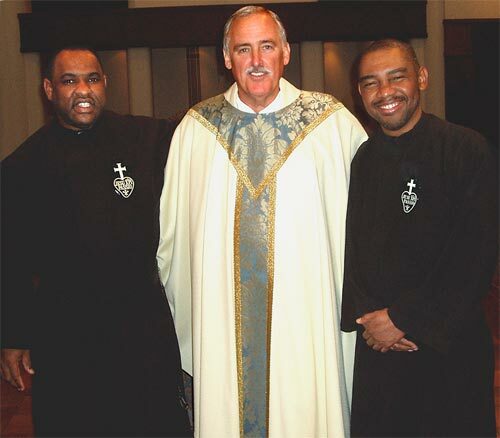 Those who took part in the Passionist Youth Encounter and World Youth Day will remember Ian Gayle and Michael Rowe, two Passionist students from Jamaica who are at present studying at Catholic Theological Union, Chicago. Before going to Australia, Michael and Ian were interviewed for Compassion magazine. The interview was published under the title Walk Good. Tomorrow is the Feast of the Founder of the Passionists, Saint Paul of the Cross. Father Gary has put up lots of interesting and useful information and links at The Passionist Charism. 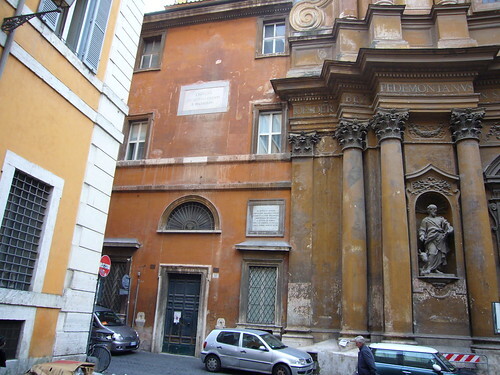 To mark the Feast, I thought I would post some pictures of a building I was able to visit for the first time when I was in Rome earlier this month: the Hospice of the Trinity for Convalescents and Pilgrims. The Hospice and its Confraternity were founded by Saint Philip Neri to care for poor pilgrims and those who were recovering from illness. It grew to be one of the biggest buildings in Rome. 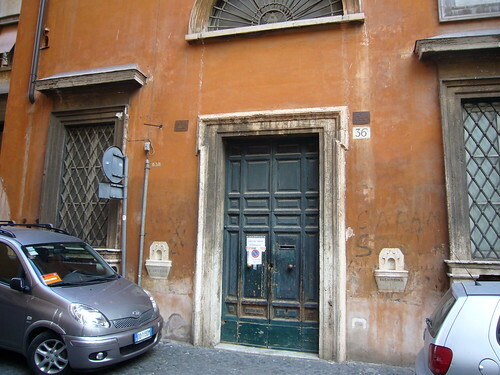 Saint Paul of the Cross stayed here on his first visit to Rome in September 1721. 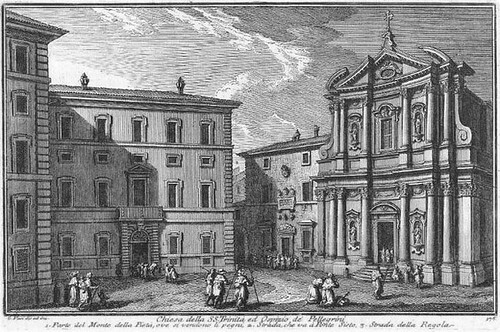 Here is an engraving by Giuseppe Vasi of the Hospice and the adjoining Church of the Most Holy Trinity. The eighteenth-century engraver Vasi was a contemporary of Saint Paul of the Cross and the teacher of Piranesi. 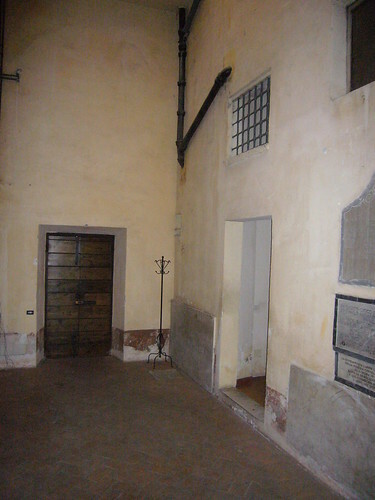 After the unification of Italy, most of the Hospice was converted into apartments. For many years, the remaining buildings were virtually closed to the public. I had tried on a number of occasions to visit the Church and what remains of the Hospice, but without success. 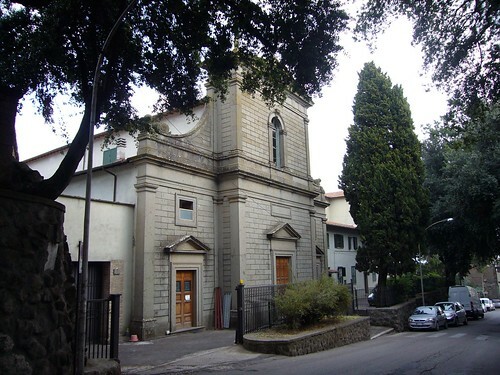 However, the status of the buildings has now changed, with the Church being entrusted to the Priestly Fraternity of Saint Peter as a personal parish. I went to see the Church with Father Lawrence Rywalt C.P., hoping to be able to see something of the Hospice too. 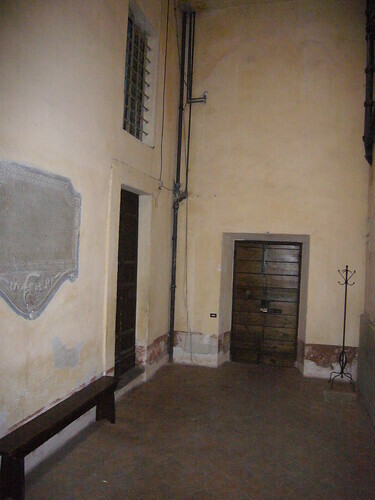 We could not go in the main door of the Hospice; this leads to the Great Hall where pilgrims were welcomed and fed. The Great Hall is now used by the Sant’Egidio Community. I hope to be able to visit it some time in the future. We introduced ourselves to the Parish Priest, Father Joseph Kramer FSSP, who is Australian. Father Kramer, who in a short time has acquired an impressive knowledge of the history of the buildings, brought us through the Sacristy to visit those parts of the Hospice which are open to his community. The picture below and the previous one give a sense of what the building must have been like when Saint Paul of the Cross stayed there. 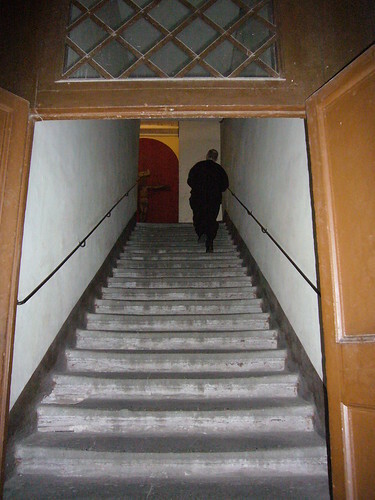 Here is Father Lawrence climbing the staircase to what was the dormitory area. The Crucifix at the top of the stairs was there in the time of Saint Paul of the Cross. He lodged that night with the other pilgrims in the Hospice of the Trinity, where Christian charity is exercised in such perfection, and reigns with so visible a spirit. Going with the rest to the washing of the feet, it happened that the person who was to perform that charitable office, was a great cardinal, Monsignor Tolomei, of happy memory, who constantly undertook this lowly employment, to the great edification of all who saw him. We can easily imagine the confusion of poor Paul, who, in his humility deemed himself worthy of nothing but contempt, especially when the holy prince, having washed his feet, offered him an alms. He, believing himself sufficiently rich with his trust in God, meekly refused the gift, and besought his eminence to bestow it on another, that thus it might benefit the poor. 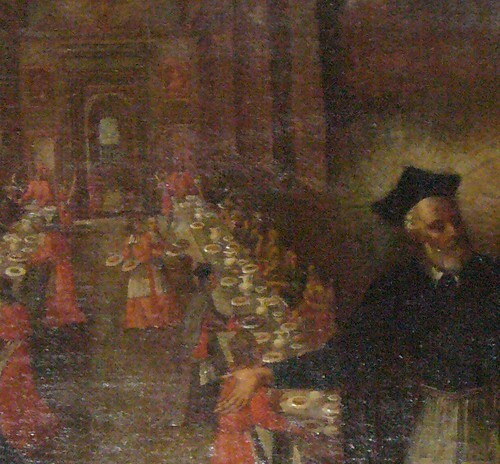 This last picture is a detail from a painting in the Confraternity Room showing the members of the Confraternity in their red robes serving the poor pilgrims in the Great Hall while Saint Philip Neri, wearing an apron over his cassock, welcomes all. On this day in 1988, Pope John Paul II beatified Father Charles of Mount Argus, together with Father Bernard Mary Silvestrelli C.P. and the Polish Capuchin Honoratus Kozminski. The photo shows my mother doing the First Reading, which was quite extraordinary as she had never read at Mass in her own parish. However, the dignitary chosen to read could not be at the rehearsal on the Saturday morning (as the Irish pilgrims were arriving on Saturday afternoon) and was consequently disqualified by the Papal Ceremonies people, so Mum had to step in. 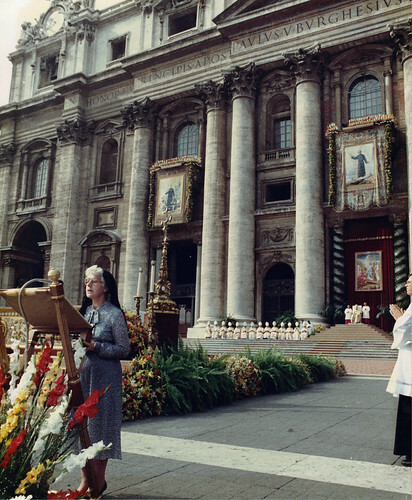 The Beatification Mass also marked the tenth anniversary of the Election of Pope John Paul II which, obviously, took place on 16 October 1978. 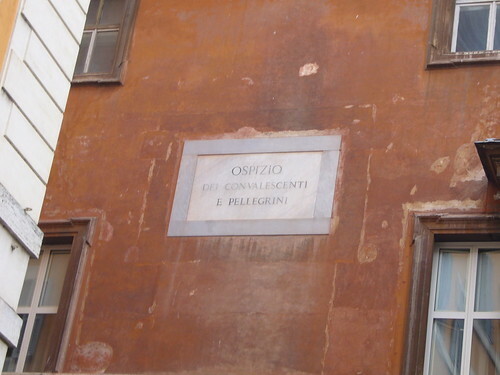 For this reason the Mass was held in Saint Peter’s Square; the postulators (CP and OFM Cap) had wanted it in the Basilica in case it might rain, but the Pope’s anniversary meant that it was moved to the square, necessitating the making of a second Arazzo for each new Beatus, as the originals were now too small (which is why there is one in Dublin and one in Munstergeleen). Fortunately, it was a beautiful sunny day – Father Charles only learned how to make it rain later on. The answer to Where? 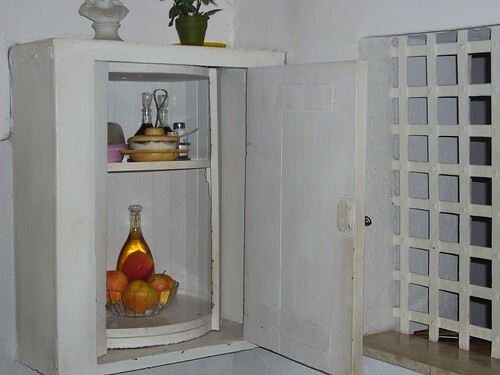 is the Monastery of the Passionist Nuns at Vignanello, Italy (shown above). Joee (seconded by Mark) was at least right in thinking that it was a monastery. Ed, by using the word Turn showed that he knew it was a Nuns’ monastery. Kenneth guessed that it was in Italy. But the nearest to a winner is Berenike who guessed correctly that it was, as she put it: a nunnery, an Italian nunnery and (by suggesting Costiglioli d’Asti) a Passionist nunnery; unfortunately, her love for Lombardy made her fall at the last hurdle and she guessed the wrong house. Easily done, as the Passionist Contemplative Nuns have twelve houses in Italy. Vignanello is a small hill-top town somewhere between Rome and Assisi. For more pictures of the town, follow this link to my Flickr site. I have been visiting this community since the beginning of 2004 when I was appointed to work with them and two other houses to set up a federation which would co-operate for formation and to support the Nuns’ foundation in Indonesia. Next month, they will have the second assembly of the federation and my time as Delegato Pontificio to these nuns will come to an end. The monastery at Vignanello has been making vestments for the Vatican since the time of Pope Pius XII. Pope John Paul II kept them very busy with chasubles, albs and surplices not just for the Vatican Basilica but for all his apostolc journeys. Pope Benedict doesn’t travel so much, so the workload of the nuns has decreased in recent years. I have since returned to Rome. Yesterday, I went for a walk to Saint Peter’s with Father Patrick from the French Province who is living at present at our house at Rocca di Papa. 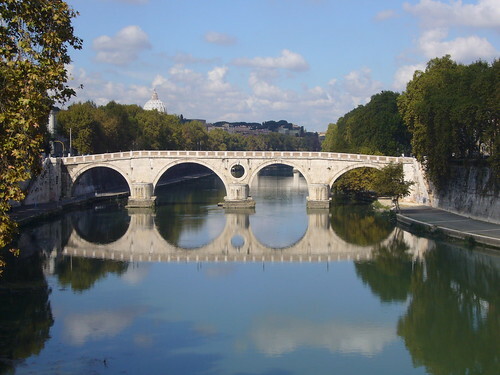 I took the above picture of the Ponte Sisto, which I think turned out quite well (-the photo, that is; the bridge turned out well a long time ago). At Saint Peter’s we happened to meet my good friend Father Paul Milarvie, Rector of the Scots College. Father Paul’s father was my French teacher at Saint Mungo’s Academy; little did he or I know that he was belting a future Anglophone Pastor of Paris (not Plaster of Paris, as Father Anthony used to call me). I’ve also been able to spend some time at the General Archives of the Passionists where yesterday they were cataloguing my classmate Father Thomas Scanlon’s dissertation which he completed a couple of years ago; things always take longer in Rome. Joee asked if there was a prize for the right answer. Well, there would have been, Joee, if you had got the right answer. The nearest to it was Berenike. 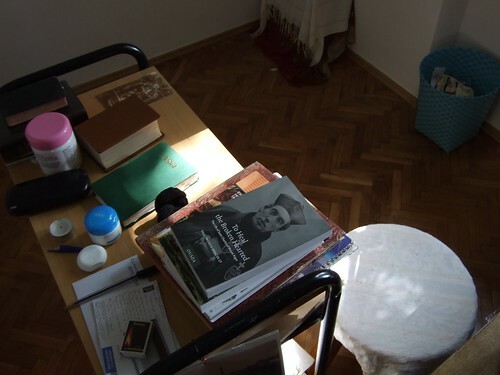 I had thought of giving a copy of my book on Saint Charles of Mount Argus but, as this photo of her desk (taken by our Warsaw correspondent) shows, she already has one; it’ll just have to be three Hail Marys instead.